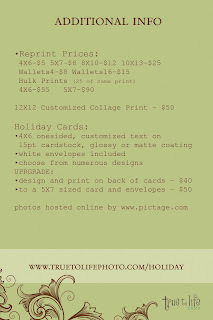 Here is my Holiday Special that I'm offering this year. I've added new card designs and a few featured from last year. 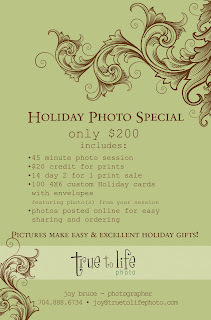 Consider this an all in one - family photos that you've been putting off, Christmas Cards and Christmas gifts rolled all into one. What could be better? Book now! Spaces are filling up. Because I operate my business on minimal advertising and mostly word of mouth, I would greatly appreciate the effort in passing on my information via 'word of mouth'.